Monday, 13 March 2017: Ten of our students in grades 3-8 visited the research laboratory of Prof. Graciela Unguez for 3 hours. She and her group study weakly electric fish (Stenopygus species), who use their electrical sense to find food and avoid predators. They also can regrow their tails, providing a great study of tissue development, as well as genetics and physiology. The students along with Head of School Dr. Lou Ellen Kay and Board Chair Dr. Vince Gutschick caught the Las Cruces bus near our school and rode to campus. Graciela’s undergraduate students had laid out about 8 stations, where our students could learn about the fish with hands-on activities. 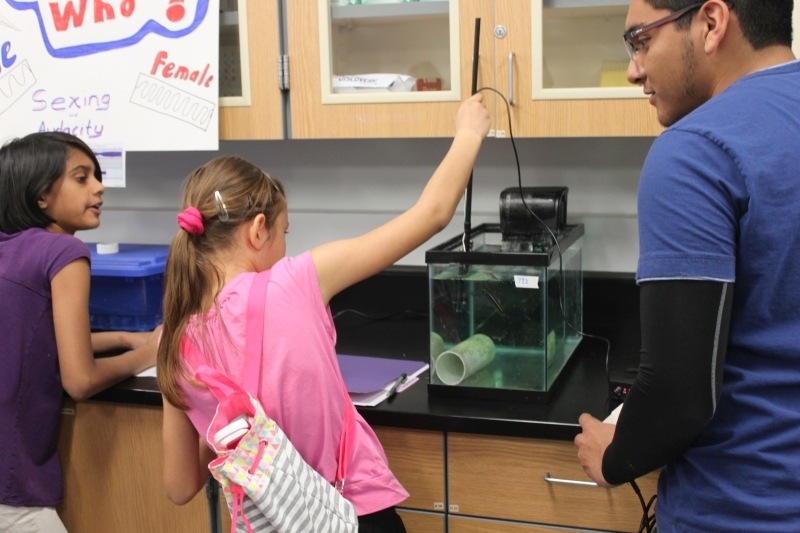 Check out the pictures with students using the detector of the fish’s electric fields, and also the fish themselves, both hiding in favorite tubes or swimming with ethereal fins. At the end of the visit, many of us participated in a game of navigating by touch (hula hoops).